When Jesus had spoken these words, he went out with his disciples over the brook Kidron, where there was a garden, into which he and his disciples entered. Now Judas, who betrayed him, also knew the place, for Jesus often met there with his disciples. Judas then, having taken a detachment of soldiers and officers from the chief priests and the Pharisees, came there with lanterns, torches, and weapons. Jesus therefore, knowing all the things that were happening to him, went forth, and said to them, "Who are you looking for?" They answered him, "Jesus of Nazareth." Jesus said to them, "I am he." Judas also, who betrayed him, was standing with them. When therefore he said to them, "I am he," they went backward, and fell to the ground. Again therefore he asked them, "Who are you looking for?" They said, "Jesus of Nazareth." Simon Peter therefore, having a sword, drew it, and struck the high priest's servant, and cut off his right ear. The servant's name was Malchus. Jesus therefore said to Peter, "Put the sword into its sheath. The cup which the Father has given me, shall I not surely drink it?" So the detachment, the commanding officer, and the officers of the Jews, seized Jesus and bound him, and led him to Annas first, for he was father-in-law to Caiaphas, who was high priest that year. Now it was Caiaphas who advised the Jews that it was expedient that one man should perish for the people. Simon Peter followed Jesus, as did another disciple. Now that disciple was known to the high priest, and entered in with Jesus into the court of the high priest; but Peter was standing at the door outside. So the other disciple, who was known to the high priest, went out and spoke to her who kept the door, and brought in Peter. Then the maid who kept the door said to Peter, "Are you also one of this man's disciples?" He said, "I am not." Now the servants and the officers were standing there, having made a fire of coals, for it was cold. They were warming themselves. Peter was with them, standing and warming himself. The high priest therefore asked Jesus about his disciples, and about his teaching. Jesus answered him, "I spoke openly to the world. I always taught in synagogues, and in the temple, where the Jews always meet. I said nothing in secret. Why do you ask me? Ask those who have heard me what I said to them. Behold, these know the things which I said." Annas sent him bound to Caiaphas, the high priest. Now Simon Peter was standing and warming himself. They said therefore to him, "You aren't also one of his disciples, are you?" He denied it, and said, "I am not." One of the servants of the high priest, being a relative of him whose ear Peter had cut off, said, "Didn't I see you in the garden with him?" Peter therefore denied it again, and immediately the rooster crowed. They led Jesus therefore from Caiaphas into the Praetorium. It was early, and they themselves didn't enter into the Praetorium, that they might not be defiled, but might eat the Passover. Pilate therefore went out to them, and said, "What accusation do you bring against this man?" They answered him, "If this man weren't an evildoer, we wouldn't have delivered him up to you." Pilate therefore said to them, "Take him yourselves, and judge him according to your law." Therefore the Jews said to him, "It is not lawful for us to put anyone to death," that the word of Jesus might be fulfilled, which he spoke, signifying by what kind of death he should die. Jesus answered him, "Do you say this by yourself, or did others tell you about me?" Pilate answered, "I'm not a Jew, am I? Your own nation and the chief priests delivered you to me. What have you done?" Pilate therefore said to him, "Are you a king then?" Jesus answered, "You say that I am a king. For this reason I have been born, and for this reason I have come into the world, that I should testify to the truth. Everyone who is of the truth listens to my voice." Pilate said to him, "What is truth?" When he had said this, hewent out again to the Jews, and said to them, "I find no basis for a charge against him. But you have a custom, that I should release someone to you at the Passover. Therefore do you want me to release to you the King of the Jews?" Then they all shouted again, saying, "Not this man, but Barabbas!" Now Barabbas was a robber. So Pilate then took Jesus, and flogged him. The soldiers twisted thorns into a crown, and put it on his head, and dressed him in a purple garment. They kept saying, "Hail, King of the Jews!" and they kept slapping him. Then Pilate went out again, and said to them, "Behold, I bring him out to you, that you may know that I find no basis for a charge against him." Jesus therefore came out, wearing the crown of thorns and the purple garment. Pilate said to them, "Behold, the man!" When therefore the chief priests and the officers saw him, they shouted, saying, "Crucify! Crucify!" Pilate said to them, "Take him yourselves, and crucify him, for I find no basis for a charge against him." The Jews answered him, "We have a law, and by our law he ought to die, because he made himself the Son of God." When therefore Pilate heard this saying, he was more afraid. He entered into the Praetorium again, and said to Jesus, "Where are you from?" But Jesus gave him no answer. Pilate therefore said to him, "Aren't you speaking to me? Don't you know that I have power to release you, and have power to crucify you?" Jesus answered, "You would have no power at all against me, unless it were given to you from above. Therefore he who delivered me to you has greater sin." At this, Pilate was seeking to release him, but the Jews cried out, saying, "If you release this man, you aren't Caesar's friend! Everyone who makes himself a king speaks against Caesar!" When Pilate therefore heard these words, he brought Jesus out, and sat down on the judgment seat at a place called "The Pavement," but in Hebrew, "Gabbatha." Now it was the Preparation Day of the Passover, at aboutthe sixth hour. He said to the Jews, "Behold, your King!" They cried out, "Away with him! Away with him! Crucify him!" Pilate said to them, "Shall I crucify your King?" The chief priests answered, "We have no king but Caesar!" So then he delivered him to them to be crucified. So they took Jesus and led him away. He went out, bearing his cross, to the place called "The Place of a Skull," which is called in Hebrew, "Golgotha," where they crucified him, and with him two others, on either side one, and Jesus in the middle. Pilate wrote a title also, and put it on the cross. There was written, "JESUS OF NAZARETH, THE KING OF THE JEWS." Therefore many of the Jews read this title, for the place where Jesus was crucified was near the city; and it was written in Hebrew, in Latin, and in Greek. The chief priests of the Jews therefore said to Pilate, "Don't write, 'The King of the Jews,' but, 'he said, I am King of the Jews.'" "They parted my garments among them. Therefore the soldiers did these things. But there were standing by the cross of Jesus his mother, and his mother's sister, Mary the wife of Clopas, and Mary Magdalene. Therefore when Jesus saw his mother, and the disciple whom he loved standing there, he said to his mother, "Woman, behold your [child]!" Then he said to the disciple, "Behold, your mother!" From that hour, [Mary was taken into the disciple's] own home. After this, Jesus,seeing that all things were now finished, that the Scripture might be fulfilled, said, "I am thirsty." Now a vessel full of vinegar was set there; so they put a sponge full of the vinegar on hyssop, and held it at his mouth. When Jesus therefore had received the vinegar, he said, "It is finished." He bowed his head, and gave up his spirit. After these things, Joseph of Arimathaea, being a disciple of Jesus, but secretly for fear of the Jews, asked of Pilate that he might take away Jesus' body. Pilate gave him permission. He came therefore and took away his body. Nicodemus, who at first came to Jesus by night, also came bringing a mixture of myrrh and aloes, abouta hundred Roman pounds. So they took Jesus' body,and bound it in linen cloths with the spices, as the custom of the Jews is to bury. (See Nicodemus's previous appearances in John 3 and 7). Now in the place where he was crucified there was a garden. In the garden was a new tomb in which no man had ever yet been laid. Then because of the Jews' Preparation Day (for the tomb was near at hand) they laid Jesus there. Thanks for posting that Myrle. 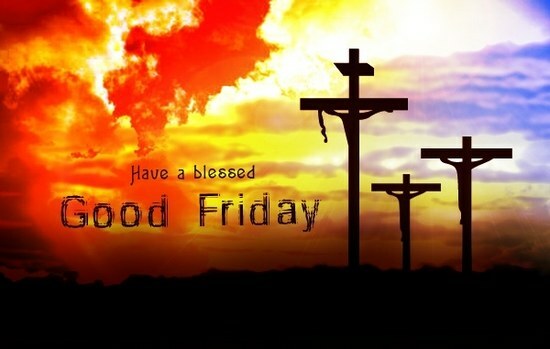 Have a blessed Good Friday! Kelley Mooney's spiritual lyrical adaptation of Leonard Cohen's "Hallelujah"
This video is the Easter version, with lyrics changed. I cried, no sobbed when I listened to it. I missed this last year. Thanks for the bump, Jim. Pray... and reflect on Easter, for He has risen. I wish a blessed Good Friday and Happy Easter to all! Thanks, Myrle. And a blessed Good Friday to you. Thanks for the bump, @jmyrlefuller! Annual bump. This time, I will do the Synoptic version. Then Jesus came with them to a place called Gethsemane, and said to his disciples, "Sit here, while I go there and pray." He took with him Peter and the two sons of Zebedee, and began to be sorrowful and severely troubled. Then he said to them, "My soul is exceedingly sorrowful, even to death. Stay here, and watch with me." He went forward a little, fell on his face, and prayed, saying, "My Father, if it is possible, let this cup pass away from me; nevertheless, not what I desire, but what you desire." He came to the disciples, and found them sleeping, and said to Peter, "What, couldn't you watch with me for one hour? Watch and pray, that you don't enter into temptation. The spirit indeed is willing, but the flesh is weak." Again, a second time he went away, and prayed, saying, "My Father, if this cup can't pass away from me unless I drink it, your desire be done." He came again and found them sleeping, for their eyes were heavy. He left them again, went away, and prayed a third time, saying the same words. Then he came to his disciples, and said to them, "Sleep on now, and take your rest. Behold, the hour is at hand, and the Son of Man is betrayed into the hands of sinners. Arise, let's be going. Behold, he who betrays me is at hand." While he was still speaking, behold, Judas, one of the twelve, came, and with him a great multitude with swords and clubs, from the chief priest and elders of the people. Now he who betrayed him gave them a sign, saying, "Whoever I kiss, he is the one. Seize him." Immediately he came to Jesus, and said, "Hail, Rabbi!" and kissed him. Jesus said to him, "Friend, why are you here?" Then they came and laid hands on Jesus, and took him. Behold, one of those who were with Jesus stretched out his hand, and drew his sword, and struck the servant of the high priest, and struck off his ear. Then Jesus said to him, "Put your sword back into its place, for all those who take the sword will die by the sword. Or do you think that I couldn't ask my Father, and he would even now send me more than twelve legions of angels? How then would the Scriptures be fulfilled that it must be so?" In that hour Jesus said to the multitudes, "Have you come out as against a robber with swords and clubs to seize me? I sat daily in the temple teaching, and you didn't arrest me. But all this has happened, that the Scriptures of the prophets might be fulfilled." Then all the disciples left him, and fled. Those who had taken Jesus led him away to Caiaphas the high priest, where the scribes and the elders were gathered together. But Peter followed him from a distance, to the court of the high priest, and entered in and sat with the officers, to see the end. Now the chief priests, the elders, and the whole council sought false testimony against Jesus, that they might put him to death; and they found none. Even though many false witnesses came forward, they found none. But at last two false witnesses came forward, and said, "This man said, 'I am able to destroy the temple of God, and to build it in three days.'" The high priest stood up, and said to him, "Have you no answer? What is this that these testify against you?" But Jesus held his peace. The high priest answered him, "I adjure you by the living God, that you tell us whether you are the Christ, the Son of God." Then the high priest tore his clothing, saying, "He has spoken blasphemy! Why do we need any more witnesses? Behold, now you have heard his blasphemy. What do you think?" They answered, "He is worthy of death!" Then they spit in his face and beat him with their fists, and some slapped him, saying, "Prophesy to us, you Christ! Who hit you?" Now Peter was sitting outside in the court, and a maid came to him, saying, "You were also with Jesus, the Galilean!" But he denied it before them all, saying, "I don't know what you are talking about." When he had gone out onto the porch, someone else saw him, and said to those who were there, "This man also was with Jesus of Nazareth." Again he denied it with an oath, "I don't know the man." After a little while those who stood by came and said to Peter, "Surely you are also one of them, for your speech makes you known." Then he began to curse and to swear, "I don't know the man!" Immediately the rooster crowed. Peter remembered the word which Jesus had said to him, "Before the rooster crows, you will deny me three times." He went out and wept bitterly. Now when morning had come, all the chief priests and the elders of the people took counsel against Jesus to put him to death: and they bound him, and led him away, and delivered him up to Pontius Pilate, the governor. Then Judas, who betrayed him, when he saw that Jesus was condemned, felt remorse, and brought back the thirty pieces of silver to the chief priests and elders, saying, "I have sinned in that I betrayed innocent blood." But they said, "What is that to us? You see to it." as the Lord commanded me." NOTE: This is actually a paraphrase of Zechariah 11:13; why Matthew misattributes it to Jeremiah is unclear. Now Jesus stood before the governor: and the governor asked him, saying, "Are you the King of the Jews?" Jesus said to him, "So you say." When he was accused by the chief priests and elders, he answered nothing. Then Pilate said to him, "Don't you hear how many things they testify against you?" He gave him no answer, not even one word, so that the governor marveled greatly. Now at the feast the governor was accustomed to release to the multitude one prisoner, whom they desired. They had then a notable prisoner, called Barabbas. When therefore they were gathered together, Pilate said to them, "Whom do you want me to release to you? Barabbas, or Jesus, who is called Christ?" For he knew that because of envy they had delivered him up. While he was sitting on the judgment seat, his wife sent to him, saying, "Have nothing to do with that righteous man, for I have suffered many things this day in a dream because of him." Now the chief priests and the elders persuaded the multitudes to ask for Barabbas, and destroy Jesus. But the governor answered them, "Which of the two do you want me to release to you?" They said, "Barabbas!" Pilate said to them, "What then shall I do to Jesus, who is called Christ?" They all said to him, "Let him be crucified!" But the governor said, "Why? What evil has he done?" But they cried out exceedingly, saying, "Let him be crucified!" So when Pilate saw that nothing was being gained, but rather that a disturbance was starting, he took water, and washed his hands before the multitude, saying, "I am innocent of the blood of this righteous person. You see to it." All the people answered, "May his blood be on us, and on our children!" Then he released to them Barabbas, but Jesus he flogged and delivered to be crucified. Then the governor's soldiers took Jesus into the Praetorium, and gathered the whole garrison together against him. They stripped him, and put a scarlet robe on him. They braided a crown of thorns and put it on his head, and a reed in his right hand; and they kneeled down before him, and mocked him, saying, "Hail, King of the Jews!" They spat on him, and took the reed and struck him on the head. When they had mocked him, they took the robe off of him, and put his clothes on him, and led him away to crucify him. As they came out, they found a man of Cyrene, Simon by name, and they compelled him to go with them, that he might carry his cross. They came to a place called "Golgotha," that is to say, "The place of a skull." They gave him sour wine to drink mixed with gall. When he had tasted it, he would not drink. When they had crucified him, they divided his clothing among them, casting lots, and they sat and watched him there. They set up over his head the accusation against him written, "THIS IS JESUS, THE KING OF THE JEWS." Then there were two robbers crucified with him, one on his right hand and one on the left. Those who passed by blasphemed him, wagging their heads, and saying, "You who destroy the temple, and build it in three days, save yourself! If you are the Son of God, come down from the cross!" Likewise the chief priests also mocking, with the scribes,the Pharisees, and the elders, said, "He saved others, but he can't save himself. If he is the King of Israel, let him come down from the cross now, and we will believe in him. He trusts in God. Let God deliver him now, if he wants him; for he said, 'I am the Son of God.'" The robbers also who were crucified with him cast on him the same reproach. Now from the sixth hour there was darkness over all the land until theninth hour. About the ninth hour Jesus cried with a loud voice, saying, "Eli, Eli,lima sabachthani?" That is, "My God, my God, why have you forsaken me?" Some of them who stood there, when they heard it, said, "This man is calling Elijah." Immediately one of them ran, and took a sponge, and filled it with vinegar, and put it on a reed, and gave him a drink. The rest said, "Let him be. Let's see whether Elijah comes to save him." Jesus cried again with a loud voice, and yielded up his spirit. Behold, the veil of the temple was torn in two from the top to the bottom. The earth quaked and the rocks were split. Now the centurion, and those who were with him watching Jesus, when they saw the earthquake, and the things that were done, feared exceedingly, saying, "Truly this was the Son of God." Many women were there watching from afar, who had followed Jesus from Galilee, serving him. Among them were Mary Magdalene, Mary the mother of James and Joses, and the mother of the sons of Zebedee. When evening had come, a rich man from Arimathaea, named Joseph, who himself was also Jesus' disciple came. This man went to Pilate, and asked for Jesus' body. Then Pilate commanded the body to be given up. Joseph took the body, and wrapped it in a clean linen cloth, and laid it in his own new tomb, which he had cut out in the rock, and he rolled a great stone to the door of the tomb, and departed. Mary Magdalene was there, and the other Mary, sitting opposite the tomb. 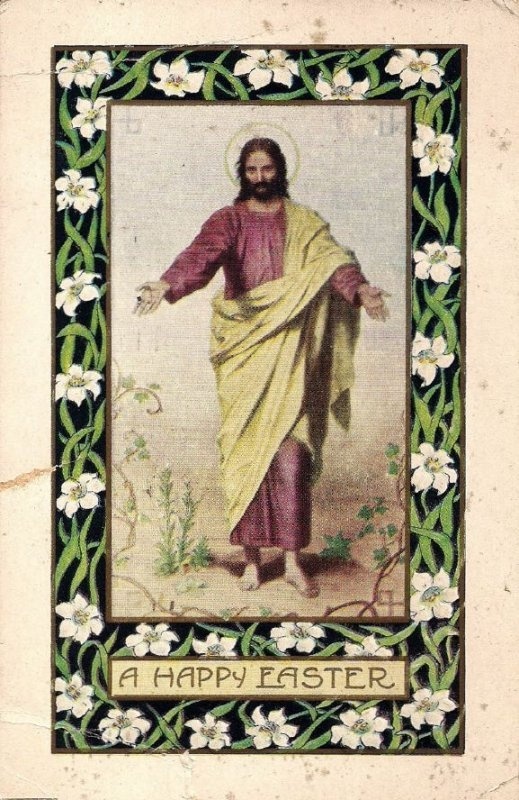 Now on the next day, which was the day after the Preparation Day, the chief priests and the Pharisees were gathered together to Pilate, saying, "Sir, we remember what that deceiver said while he was still alive: 'After three days I will rise again.' Command therefore that the tomb be made secure until the third day, lest perhaps his disciples come at night and steal him away, and tell the people, 'He is risen from the dead;' and the last deception will be worse than the first." Pilate said to them, "You have a guard. Go, make it as secure as you can." So they went with the guard and made the tomb secure, sealing the stone. I remember the Stations of the Cross when I was in grade school. The solemnity and the incense. And the Latin mass. Page created in 1.327 seconds with 22 queries.